I love when Zoya does their exchanges. It's a great way to try new colors on a budget, while helping to save the Earth! Zoya makes it easy to swap out old nail polish for new ones. Visit www.zoya.com and add at least 6 bottles and no more than 24 bottles of polish to your cart (salon accounts minimum 12 maximum 48 bottles). Excludes ALL Summer 2014 Collection shades (Tickled, Bubbly & Summer Magical PixieDust). Your order value will be adjusted to reflect a 50% discount (we use these funds to properly dispose of the old nail polish). For an example of how your order should look, see example below. Complete check-out, review and submit order. Once you get your order - ship back the equivalent number of bottles you received to the return address below (ie. If you ordered 6 bottles of Zoya - you would send us 6 NON-ZOYA polishes). Please check with your carrier on the proper way to ship nail polish. Include a copy of your invoice/order. Once we receive your polish we do the rest! It's that simple! The nail polish exchange is back! 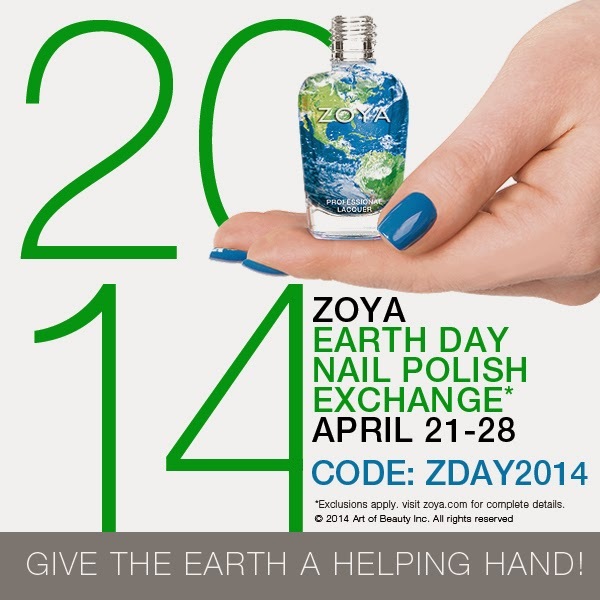 Zoya is helping you with your spring cleaning. Get 50% off Zoya nail polish when you send in your old polish. Check out Zoya.com for details. Hurry and place your order...you have until Friday, April 26th! For Earth Day 2010, Lancome spokes model partnered with environmentalist Elettra Wiedemann's Charity, Justonefrickenday.com, with a mission to unify and concentrate available resources onto a small number of special charity projects around the world. By logging on its website, you can calculate and donate just one day of your daily pay to make a difference. The charity's latest project will raise funds to help install Solar Electric Panels that will provide sustainable power to a hospital in one of the world's poorest countries, Brundi. Also, from April 22nd through April 25th, anyone who purchases Juicy Tubes 100% Natural Origin at the Lancome Boutique on the Upper West Side in NYC will receive a complimentary limited edition tee. Lancome will also make a donation to Justonefrickenday.com to kick off this special Earth Day offering. At Aveda, the month of April is designated as Earth Month, and since starting this event in 1999, with the help of their guests and network of salons, they have raised more than $14 million for grassroots organizations that protect biodiversity and address environmental issues around the world. 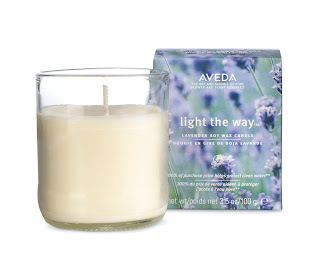 Go to Aveda.com, an Aveda store or salon/spa and purchase a limited edition Light the Way candle, made with 100% organic lavender aroma. 100% of the proceeds from this $12 candle go to their global Earth Month Partner, Global Greengrants Fund. I was fortunate enough to try one of these candles out. When lit, the rooms smells like an Aveda spa! It's perfect for your bathroom or as a housewarming gift. Don't forget about Mother's Day as well, and mom will be proud knowing that her gift went towards a good cause. Visit AvedaEarthMonth.org and donate to an organization that's helping to protect water right where you live. Participate in one of the 100+ Aveda Walk for Water events occurring around the globe around the week of April 22nd. Visit AvedaWalkforWater.com to find the water location nearest you. Visit your favorite local Aveda salon/spa and participate in one of the many fun events they'll be hosting during the month of April. Tinte Cosmetics is having an Earth Day Sale - Use code EARTH for 30% off. Sale ends April 23rd. Their Matchbook Kits and packaging for Lip Shine is 100% recyclable! LIV GRN is geared toward the modern-day eco-savvy market - merging sty le and comfort with earth sustaining materials. 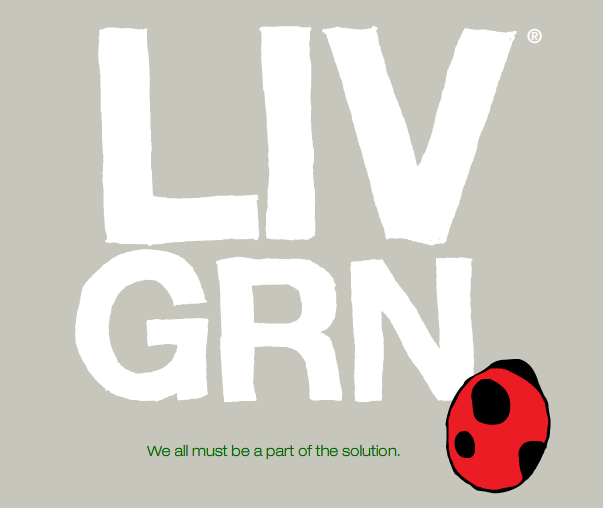 LIV GRN also donates 10% of profits to Global Green, (www.globalgreen.org). Eco celeb fans include Cameron Diaz, Sarah Michelle Gellar, Ellen Degeneres, Jessica Alba, Reese Witherspoon, Adrian Grenier, Leonardo DiCaprio and more! Now until Sunday the 25th, go to www.Biggby.com and buy one mug and get your 2nd mug of equal or lesser value for FREE! Just make a note in the comments section when purchasing that you are B-eing green and they will send you a confirmation e-mail with your final cost. You will only be charged for the higher priced mug as well as sales tax and shipping. Early Mother's Day gift idea?? The jane iredale Refillable Compact not only contains an all natural pressed powder but it is sustainable, durable, refillable, and light. The refills, which are packaged in plastic clamshells, are maufactured from 100% recycled "post-consumer" material. The clamshells are bar coded with all product detail printed on the outer surface, eliminating the need for additional print materials. Mrs. Meyer's Liquid Hand Soaps in Geranium, Lemon Verbena, Lavender and Basil. All products are made with natural ingredients and come with biodegradable packaging. Available at www.MrsMeyers.com for under $5.